The Capt. Stacy Fishing Center provides a fun fishing experience from the moment passengers step off the docks and onto the 83’ ft. long head boat, the “Capt. Stacy IV.” Equipped with some of the most modern electronics available, and with ample room for up to 100 passengers, patrons will be treated to a comfortable environment while they dip their lines for some of the Crystal Coast region’s best catches. The marina and head boat are found in the heart of Atlantic Beach along the Atlantic Beach Causeway, which makes it easy to reach for both island visitors and Morehead City or Beaufort vacationers alike. The vessel if fully outfitted to ensure plenty of comfort, with amenities which include Sirius Satellite Stereo, sundeck, and a modern galley for hot & cold food in addition to your favorite beverage. The on-site marina has plenty of fishing gear, bait, and supplies, and anglers who board the Capt. Stacy IV can enjoy a world of adventures, from shark fishing trips, to deep sea bottom fishing expeditions, to overnight fishing trips. A fun adventure for all ages, and a cool stop for visitors to simply explore and admire the view, the Capt. 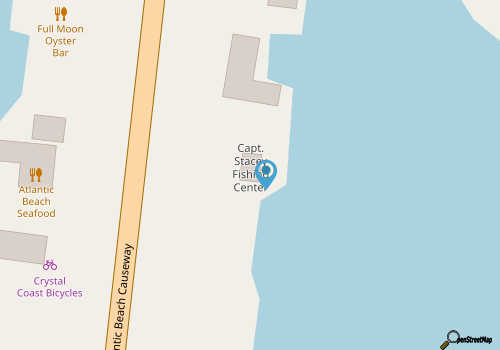 Stacy Fishing Center is a great headquarters for water-loving Crystal Coast visitors. Call 252-726-4675 for current hours.